Data security used to be a concern only for high-end businessmen and international spies. But now, ensuring that your data is protected from unwanted intrusion is a common concern for everyone. While the Data Locker Pro AES 320GB looks like something out of a spy movie, the password protected, security-focused portable drive is a practical solution for everyday civilians. The Data Locker’s main selling point is its security features. The drive itself looks like a gadget out of Q Division, with an LED screen that depicts a number pad. Only after the password is entered correctly can the device be unlocked and recognized by your computer. 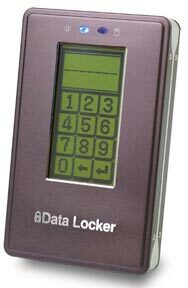 The Data Locker also has many features that can be turned on and off, including an Auto Lock feature, a hardware-based malware detection function, a panic mode self-destruct function, a brute force attack detection ability (and self-destruct response) and hardware-based AES encryption. For example, the self-destruct feature mode the Data Locker offers can be programmed to delete the data on the hard drive after nine unsuccessful attempts to unlock it. That’s a great feature against hackers, but not so great if you have a four-year old running around the house who like to pick up and play with curious-looking objects. (Now’s a great opportunity to remind you to regularly back up your data.) Unlike other security-focused drives, all of the security features are on the drive itself. Drivers and software do not have to be downloaded or accessed. The drive is about twice as thick as an iPhone and just as long and wide. The mechanism inside is a 2.5-inch SATA drive with a 5,400 rpm rotational speed and a 8MB buffer. The Data Locker is made from a combination of plastic and metal, and while it has a self-destruct mechanism to dissuade intruders from forcing entry into the drive, the enclosure still seems brittle to me and I wouldn’t recommend dropping it from heights of more than a few feet. If you’re concerned with your data’s security, the designers figure you won’t throw the drive around too much. If you remove the hard drive mechanism and install it in another case, you won’t be able to access the data, since the data is encrypted. USB-only portable drives cannot be mounted on some laptops because they have USB ports with insufficient power output to spin up the drive. The Data Locker requires 5 volt and 500mA of current from a USB port, and if your computer’s power is insufficient the second part of the included Y cable can be used to draw additional power from another USB port on your computer. While the security features are substantial, the drive’s speed tests were less impressive. The Data Locker finished our 1GB copy test in 1 minute. This score is about 10 seconds behind our results for competitive USB drives. In our duplication test, the drive tool 1 minute, 45 seconds, about 30 percent slower than the Toshiba USB 2.0 Portable External Hard Drive ( ) and Buffalo MiniStation TurboUSB Portable Hard Drive ( ). The Data Locker’s low-memory Photoshop test results were on average 10 seconds behind the Buffalo Ministation, finishing at 2 minutes flat. The likely reason for the slightly slower times is do to the encrypting process; the drive literally encrypts on the fly while writing, thus slowing down the times. The DataLocker is both Mac and PC compatible and will work with Time Machine. The drives uses a low-power consumption 2.5 inch Fujitsu laptop drive that do not require external cooling, so the drive runs relatively quietly and fanless. When you first use the drive, it mounts on your desktop as two separate 150GB volumes. The first volume can’t be modified as it contains security software, so when first launching the device you’ll only be able to use the 150GB of the second volume for storage. Reformatting the drive using Disk Utility (I was able to format as Mac OS Extended and FAT32) condenses the volumes into a single 300GB unit. Thankfully, the security features remain available even after reformatting. The company often updates the firmware for the drive to ensure that it is constantly on the forefront of secure storage devices. However, updating the drive’s firmware requires Windows. Security is a paramount concern for businesses and general consumers. Data Locker ensures that your data remains secure from hackers and unwanted intrusions, though you’ll have to make some compromises. The 320GB Data Locker Pro AES is much slower than competing drives, and offers a pricey gigabyte per dollar ratio of 93 cents. There’s a price for security, so the question is, are you willing to pay for it?